Some of my Facebook friends probably ended up blocking me because all my little goal-setting probably seemed so mundane. But it helped me. Because I hit those small (but do-able) goals. Journal my food everyday, no matter how bad it looks. Goal setting worked for me and is still working. 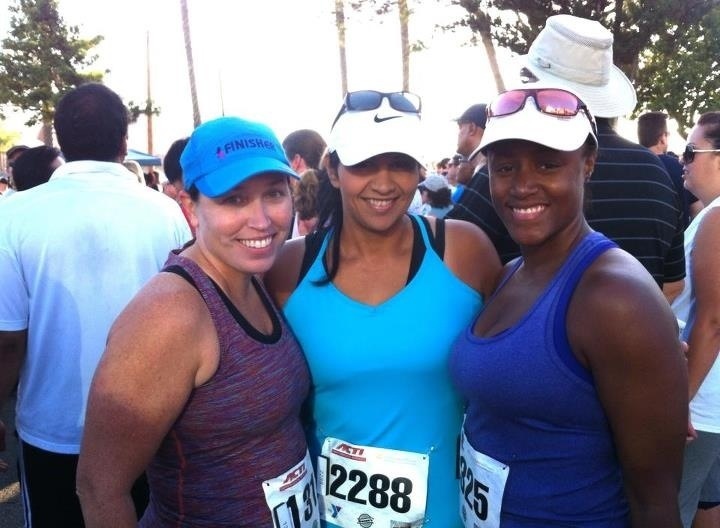 In April I started the running training program and joined a boot camp. In May I signed up for Team in Training. In June I dropped the online running schedule because my Team in Training miles were increasing and I could not do both. In July I added on food journaling. I mentioned in one of my other blogs that heartache is the worst and best thing in the world. For me, it was the worst thing in the world because I seriously wanted to die and there were tears and depression each and every day for so long. And for me, it was also the best because once I came out of it, how could I not love my life?? How could I not be grateful JUST to not feel that pain anymore? How could I not be happy at the tiniest little thing? I truly love my life today and I believe it is because the pain took me so far down I never thought I would ever see the light. Yet here I am. Surrounded by all kinds of light and love. Life is good. I am with Team in Training and fundraising AND witnessing the generosity and kindness of people who give from their heart (and wallet). I am food journaling everyday and since July 1st have lost almost 5lbs. I am logging miles like I’ve never logged before. And I have learned that training is not just logging miles. It’s showing up to practice and participating in others’ training. It is getting together and sharing ideas of what works and what doesn’t. It is listening to the coaches and doing what they suggest. it is cross training. It’s one of the most amazing experiences I’ve ever had and I am thoroughly enjoying it. It makes me smile. And that’s what our life should be doing right? Making us smile…. 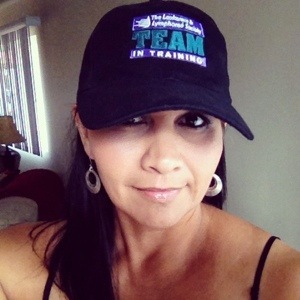 My new Team in Training hat given to me from a friend. I love it so much and can’t wait to wear it when I run!!!! 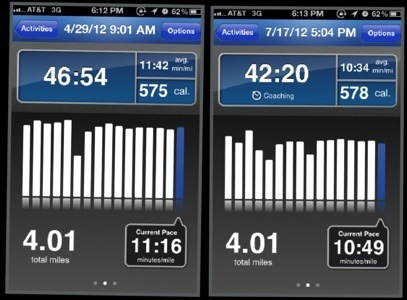 After two and a half months of consistency and goal setting…my average pace improved from 11:42 to 10:34 :-). And to think…it all started out by setting one simple goal.